Adjust and manipulate your iSight video settings from within iChat AV and many other programs, including iMovie, Photo Booth, Yahoo! Messenger and Skype. 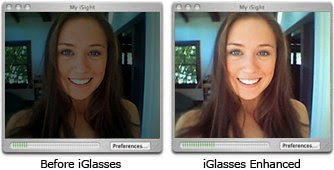 iSight too dark? It just needs iGlasses. Apply easy preset settings and fun effects to your video conferences and recordings. * iGlasses activates video conferencing on G3 computers which fall below iChat's minimum requirement of 600 MHz. * Mirror image is also available. * You can save your custom adjustments for later use. Your saved presets will appear in the iGlasses menu below the built-in presets.